Bring a little BLISS to your bowling game. The Brunswick Women's Bliss bowling shoes combine comfort, performance, and value in this basic bowling shoe. The padding around the collar and tongue as well as the lightweight rubber sole provide comfort while the superior Pure slide soles offer the performance needed for a basic bowling shoe. When will these be in it love them? Some size are in stock, but we are expecting all sizes in by the end of the month, if not sooner. Hello! Platinum Protection is if during the first year of normal use, your new shoes are damaged due to a manufacturing defect in workmanship or materials, Bowling.com will replace your shoes, immediately, free of charge! With the Platinum Protection Plan, there is no need to wait for a manufacturer warranty claim. Hello! 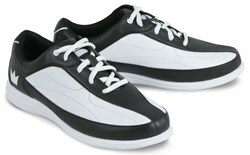 These shoes come in the regular width, which is a B width for women. Unfortunately, these slide soles will be fixed on the shoe and cannot be removed. Due to the time it takes to produce the Brunswick Womens Bliss Black/White ball it will ship in immediately. We cannot ship this ball outside the United States.